In nature chickens and other poultry met their nutritional needs by scrounging and scratching for grains, seeds, bugs (and other insects), flowers, grass, fruits, veggies and consuming fresh, clean water free choice. Chickens may now be confined and must rely on us for their nutritional needs. 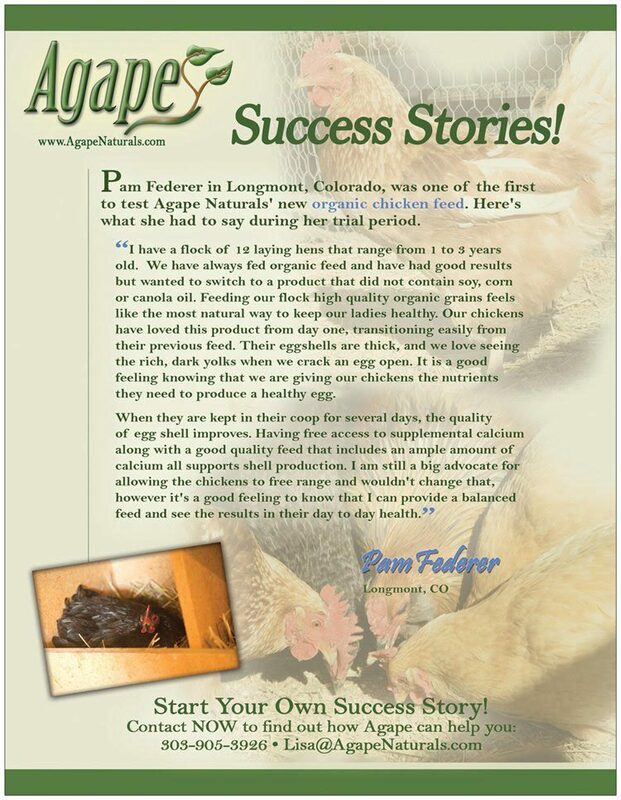 Our product choices support free choice or scheduled feedings. Need help finding feed for game birds? They have slightly different nutrition needs. Contact us— we can order natural game bird feed! Many people believe that poultry know what their bodies need. In nature they would find it. Farm or ranch flocks certainly can’t roam far to meet their nutritional needs. We offer products that support free choice feeding for your flock. All of these supplements can be fed free choice or scheduled. 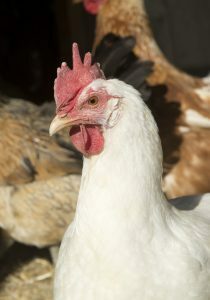 Many times farmers feed fruit/veggie scraps and allow their chickens to free range for bugs and other plant material in addition to scheduled feedings. Fresh Start is an all in one non-molasses fermented feed supplement containing yeast, vitamins, minerals, live enzymes, probiotics, prebiotics and diatomaceous earth. Fresh Start can be ordered in 50lb bags or 2,000 lb totes. Redmond Conditioner is essentially volcanic ash that acts as a toxin binder. HealthyCoat Kickin’ Chicken liquid feed supplement is naturally pressed, without chemicals and unrefined to preserve the nutritional value for the highest quality Essential Fatty Acids and Vitamin E.
Organic supplements for layers include Big Sky Organics’ Chick Starter, Grower, Layer Mash, and Scratch–available for laying hens. We also have NO SOY (with fishmeal) versions of the Chick Starter and Layer Mash. If you want feed crumbles and pellets, we have Modesto Millings’ offerings for chicks, layers, ducks, game-birds. Contact us for more info. 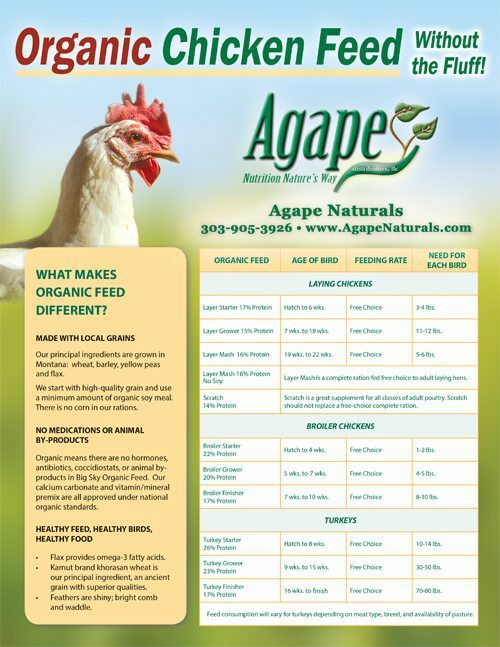 Organic supplements for broilers include Chick Broiler Starter, Grower and Finisher. Organic supplements for turkeys include Turkey Starter, Grower and Finisher. Contact us for more info an to order….